The Most Dazzling Lighting Design Stands at 100% Design September! London Design Festival: Don’t miss out the lighting stands that will brighten up your stay in London. Unfortunately, 100% Design September is almost over, but before it ends, we would like to show you some of the most outstanding lighting design stands in this incredible London trade show. Make sure you visit these lighting brands in your London Design Festival itinerary this September. As always, DelightFULL is on our list! The brand known for its unique lamps that not only illuminate interiors but also add mid-century lighting design presence to every single space is taking over London together with its sister brand Essential Home! There you will be able to see their unique collections as long as their novelties: Turner chandelier – a custom-piece – and Hendrix pendant lamp that have been captured the interest of all the design lovers of the world. Mash. T Design Studio has a full event decor service for both private and corporate functions. On their stand, you will find a variety of creative lighting solutions for all your challenges. Don’t forget to take a look. Ciara O’Neill produces lighting products that explore the subtle interplay between light and shade. 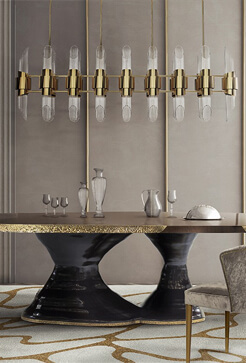 Using bespoke component and artisan production techniques, their unique pendant lamps will elevate the interior design of every single home decor. Original BTC has an astonishing stand that represents everything that the brand stands for. Innovative and classic lighting is everything we assure you will find in every single lighting piece that is inspired in the clean lines of traditional British factory fittings and iconic 1940s design. The wonderful stand of Matt Pugh can be described in three words: Modern, British, Design. Filled with contemporary lighting to die for, here you will find lamps only designed with natural materials, timeless quality and with a splash of color. 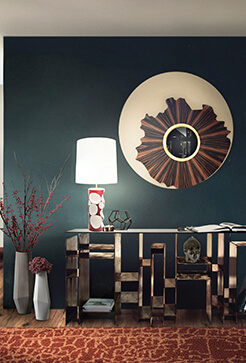 Of course, Designheure is on this list, since it has some of the most beautiful lamps we know. The brand created the link between the French industry and designers, striving to represent French chic and elegance. Here at 100% Design, you will be able to find out this link and be delighted. YOU MIGHT ALSO LIKE: 100% DESIGN SEPTEMBER 2017: DELIGHTFULL TAKES OVER LONDON! Previous 100% Design September 2017: DelightFULL Takes Over London! Next Why 100% Design Was The Best London Trade Show This Year!